Technique does not make competitors, drilling does, but a place on the podium is earned by sparring in the gym. Recently I discussed different drilling formats. One type was the simulation drill, an interaction with your training partner suggested by what happens in non-training situation. In sport jiu-jitsu it doesn't matter if you get on the podium by a single advantage or by submitting your opponent, different medals are not awarded for different types of wins, and first place is only earned if you don't lose. Pressure in Brazilian jiu-jitsu wins fights. Pressure is exerted by superior position, i.e. points, and pressure leads to submission. You can be down on points and win by submitting your opponent, but if you're ahead (and you don't lose your head) in general you will have more opportunities to submit your opponent because you have superior position. Superior position has an associated point reward. I think it is important to look for points and go after them, without losing sight of the submission or losing position for a submission attempt. With that in mind, I made a schematic of some of what can happen in the opening engagement of a sport jiu-jitsu match and the next major events that could occur in a match. This produces certain combinations of positions and points. From this schematic we can list the positions and point deficits that you could find yourself in, if your fight doesn't go your way. These are listed below. *An opponent can transition from a mounted or rear mounted position to side control due to a scramble or feeling of greater control. No points are awarded for either side in this case. Based on this list we can design drilling scenarios. For example, starting from the guard and being down two points with two minutes on the clock. Thus the top player who is up two points might chose to stall, forcing the bottom player to look for a sweep and pass. Or the top player may feel that a two point lead is to shallow, and strive to increase that margin. Or either player might go for submission seeking to end the action. 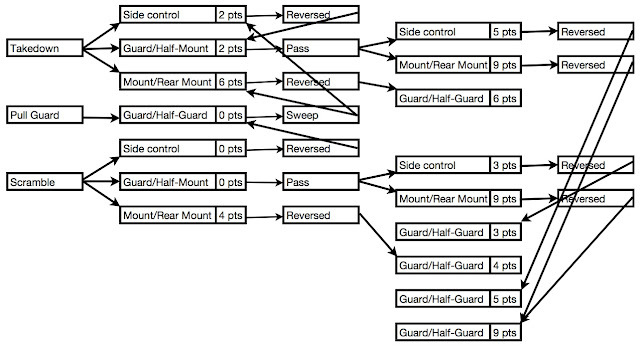 Note that the behavior of either player should be affected by the position, point differential, and time remaining. 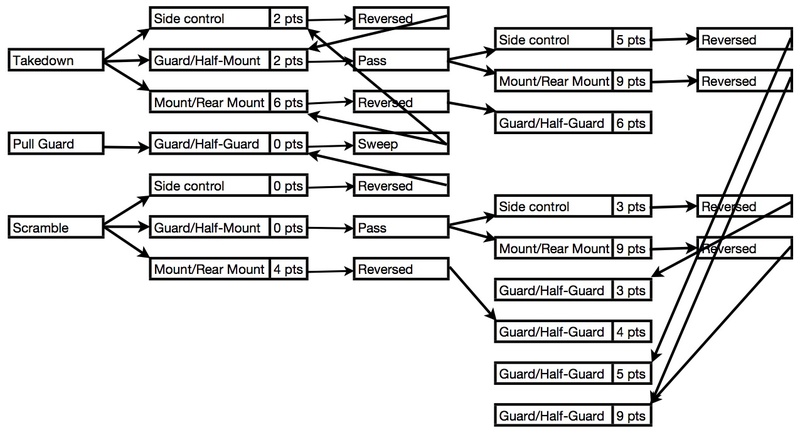 Being mounted and down six points should produce significantly different strategies than being no points down in the guard. These simulation drills can be arranged a number of different ways. Preselected time periods of 1 to 5 minutes could be used or they could be randomly selected by rolling a die. Cards with position and point deficit so that these might be randomly selected can be found here. Alternatively they could be prearranged, working on the guard for one training session and side mount another. It should be noted that it is more likely that a narrow point differential exists with more time in the round remaining than a large point difference. While I think it is important to drill pure escapes, there is a difference in strategy and energy usage when you simply escape versus having to escape and make up a point differential. While we do not want to train our athletes to expect that they will be in a bad position, knowing how to deal with it if this should happen is important. For me, I drilled from bad position was a way to work on conditioning and to work on my confidence. If I knew I could deal with a mistake, I felt more confident taking even the small risks needed to attack an opponent. Furthermore, this is a series of tutorials in the scoring system, how long it takes to score points, and strategies for scoring those points.